The deadly fungus Batrachochytrium dendrobatidis has been wiping out amphibian species across the globe for decades. But how did this global environmental disaster get started? A new study suggests that it came from doctors importing frogs for use in pregnancy tests. Since the 1980s, amphibian species have experienced a sharp decline in their numbers. Some estimates suggest that 400 or more amphibian species have gone extinct or near extinct since the die-offs began. Scientists eventually pinpointed the major cause of the devastation: chytridiomycosis, a disease brought on by an infection by the fungus Batrachochytrium dendrobatidis, or Bd. When Bd fins its away into an amphibian, it severely thickens the animal's skin, disrupting its ability to breathe and take in nutrients. Some species have a 100 percent mortality rate — but others survive the infection, seemingly unaffected by the fungus. One Bd-resistant species is the African clawed frog (Xenopus laevis). About a decade ago scientists suspected that this particular species may have served as a carrier, and facilitated the spread of chytridiomycosis, when they found Bd in a museum specimen dating back to 1934. And now, a new analysis now links the spread of the fungus in the U.S. with the spread of X. laevis, which initially began in the early 1900s. You see, at this time people were importing large numbers of the amphibian for use in research and to use as pets. Doctors eventually discovered that the African clawed frog could also be used as a pregnancy test, further increasing the number of frogs imported. The pregnancy test worked by injecting a woman's urine under the skin of a female frog. If the woman was actually pregnant, her hormones would stimulate ovulation in the frog. In the 1960s, doctors phased out this practice for more reliable pregnancy tests based on hormonal readings, and many of the test frogs were probably released in the wild. Though these frogs are no longer being imported for pregnancy tests, they are still used in research. Vredenburg's team analyzed 201 museum specimens of African clawed frogs, including many gathered in Africa and held in California. They found that two frogs gathered in Africa in 1935 had Bd, as did frogs collected decades later in the wild in California. Because these wild populations could have only reached the state by importation from Africa, the scientists believe this fortifies the connection. "We're making that link a little tighter," said Vredenburg. "That could be the explanation, or one of the pathways anyway, for this pathogen to get to the New World." The study used preserved specimens, so to find evidence of the fungus, the scientists had to analyze something that could endure the preservation process. They settled on a small genetic marker that is very small and specific to the Bd fungus. They took swabs from each frog's skin and extracted the DNA. 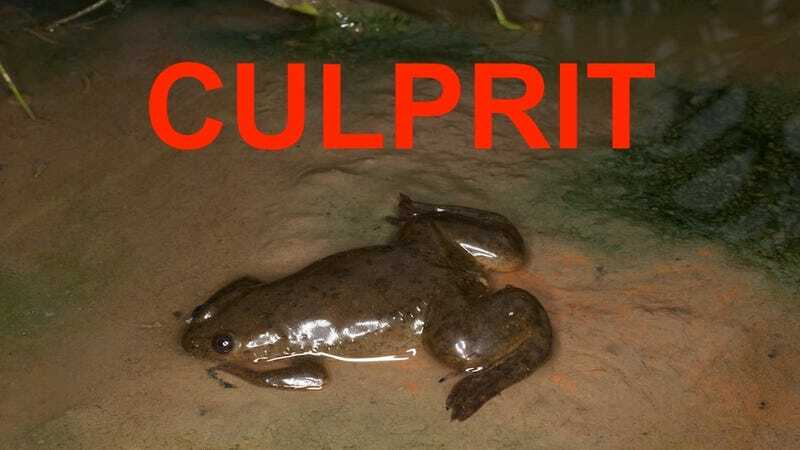 Though the ties appear strong, the scientists still need to make one more connection to be certain — they need to show that the strain of Bd killing amphibians in California is the strain as the one they found in their specimens. Read more about the work at Inside Science and National Geographic. Read the full study in PLOS One.